What does it mean to organize as a revolutionary at a time when revolution is not on the immediate agenda? One option would be to retreat to the sidelines and look with suspicion on every struggle for immediate reform as an obstacle to the maximum goal of revolution. The thinking here is that reforms of any kind simply prop up and stabilize the system rather than challenging it at its core. [T]he working masses sense the need for unity in action, for unity in resisting the onslaught of capitalism or unity in taking the offensive against it. Any party which mechanically counterposes itself to this need of the working class for unity in action will unfailingly be condemned in the minds of the workers. The “ultra-left” approach is clearly a nonstarter for serious revolutionaries. As a corrective to this sectarian approach, would it be better for revolutionaries, in the here and now, to dissolve themselves into whatever day-to-day struggles for reforms happen to exist at the moment? At the most extreme, this approach would mean accepting the ideas, strategies, self-appointed leaders and organizations currently supported by workers and the oppressed. Whatever ideas remain in the heads of revolutionaries, in practice, they water down basic political principles, like opposing all forms of oppression, and avoid anything that might sound “too radical” for the current leaders of liberal organizations and unions. Is there an alternative to these two wrong approaches? Is there a way to steer between the reefs of ultra-leftism and the shoals of opportunism? The purpose of the “united front” strategy is to try to do just that. THE UNITED front strategy was developed in the era immediately after the Russian Revolution as a tool for revolutionaries to meet the challenges of the day. There are obviously huge differences between that time, when socialist revolution was a real, near-term possibility, and today, but the method at the heart of the united front is still relevant. The idea is simple. It begins from the premise that in a non-revolutionary situation, revolutionaries must be deeply involved in the fight for immediate reforms that benefit the working class–both to improve the lives of workers in the here and now, and to increase the combativity, confidence and organizational strength of the working class as a whole, in preparation for future struggles. But in a non-revolutionary situation where organized revolutionaries are in the minority, this can only be accomplished by working alongside others who may not yet share the goal of revolutionary change. The question is: If revolutionaries must work with reformist organizations in the here and now in immediate struggles, on what terms should they seek united work? We’ve already seen the faulty approach of opportunism, which recommends that revolutionaries accept junior-partner status with the reformist leaders of existing movements, unions, liberal organizations and so on. The distinguishing feature of the united front is that revolutionaries must work alongside reformists to win immediate demands, but in a way that doesn’t force them into a passive, second-class position that cedes all leadership. How should revolutionaries do that? First of all, by uniting solely on the basis of achieving unity in action in order to win specific, concrete demands. Thus, the united front tactic is about building coalitions to fight for concrete demands, not on the basis of ideological unity, which would either mean waiting forever for reformists to accept revolutionary politics or else watering down revolutionary politics to reach an agreement. 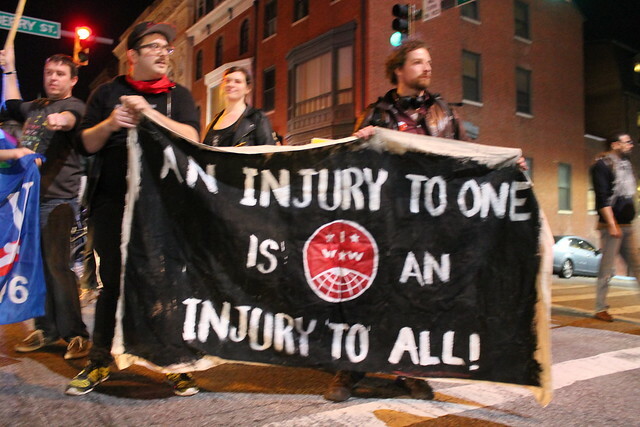 In short: when we put the united front tactic into practice, we seek to unite with those on the left who are willing to organize in good faith to try to win immediate demands that benefit workers and increase their consciousness and confidence. We don’t go into these temporary alliances expecting 100 percent agreement on all matters of political ideology, but expect there to be a variety of ideas about strategy and goals, which all sides are free to raise within the united front. THIS LEADS us to the next important aspect of the united front strategy: Once we’ve forged a united front to fight for a specific demand in the here and now, the goal for revolutionaries is to organize to achieve that demand–and, in the process, prove that we have the best strategies and ideas about how to carry the movement forward. If the movement is internally democratic and permits discussion and debate, the goal of revolutionaries should be to try to argue for the most ambitious possible course of action that can win the movement’s demands, especially when–as is likely to happen–more conservative elements lack the resolve or strategy to do this. [I]n many cases and perhaps even in the majority of cases, organizational agreements [between revolutionaries and reformists in united front coalitions] will be only half-attained or perhaps not at all. But it is necessary that the struggling masses should always be given the opportunity of convincing themselves that the non-achievement of unity in action was not due to our formalistic irreconcilability but to the real lack of will to struggle on the part of the reformists. For the united front tactic to succeed, revolutionaries must encourage rank-and-file workers and movement participants to be as confident as possible, in order to pressure reluctant reformists leaders to either go along and fight, or else expose themselves to their own members as obstacles to struggle. Either way, if carried out successfully, the united front achieves key objectives. If the reformist leaders are forced to go along and fight, the goals of revolutionaries–of winning reforms and building organizational fighting capacity among the working class–are achieved, importantly because of the contributions of revolutionaries. If the united front fails take shape, revolutionaries want it to be clear that it wasn’t the fault of their side–and so reformists may lose influence over workers who want to see a united struggle. HISTORICALLY, THE failure to implement a united front strategy has been the result of veering in the direction of sectarian purism, on the one hand, or passive tailism on the other. Both mistakes have resulted in catastrophes for the socialist movement. One infamous example that Trotsky railed against in the 1930s was the German communists, who, under the influence of Stalinism–which had come to dominate in the USSR over the genuine politics of international socialism–and in response to the rise of fascism, rejected a united front of working-class parties to confront the Nazis. By refusing to unite with other organizations of the working class to defeat fascism, the KPD contributed to the Nazis being able to divide and destroy the entire workers movement, revolutionary and reformist alike. Not long after this disastrous turn of events, the Communist Parties were directed by Stalin in Moscow to discard this ultra-left approach in favor of a strategy of building a “popular front” against fascism. This complete U-turn veered away from extreme sectarianism only to arrive at the most extreme opportunism. Under Stalin’s “popular front” strategy, revolutionaries should try to fight the right by blending into the political mainstream and following the lead of not merely reformists, but bourgeois political parties as well as the (so-called) “progressive” wing of the ruling class. In practice, this committed revolutionaries to a subordinate, passive political role that failed both in fighting the right and in building a left-wing alternative to the status quo. THIS HISTORY contains vital lessons for today, particularly when it comes to how the left–if we understand it to include reformists and revolutionaries alike, though without the mass organizations from the time of the Comintern–ought to fight against an increasingly confident and powerful right wing. The sectarian approach is a non-starter–at a time when the revolutionary left is tiny, to refuse to cooperate with any non-revolutionary organizations would be to abandon the fight against the right altogether. As we saw last November, this empty lesser evilism is more likely to give a boost to the Trump phenomenon than to actually stop it. What’s more, as leading Democrats and some trade unions pledge to give Trump a chance and work with him, it’s obvious to millions of people that defeating Trump’s agenda requires a different, more independent approach. Rather than sit on the sidelines or line up passively behind the Democrats, the united front encourages revolutionaries to seek out and build alliances with broad layers of radicalizing activists and organizations on the left, including reformists, unions, liberal organizations and so on. But–and this is crucial–a united front is an alliance whose unity comes not from flattening out ideological differences and tacking to the center, but from a shared commitment to joint action to pursue concrete demands, such as stopping deportations, defeating the ban on refugees entering the U.S., challenging restrictions on abortion and right-wing attacks on clinics, and so forth. [T]he achievement of major reforms throughout the 20th century has…in virtually every instance, required strategies and tactics of which organized reformism did not approve…[including] high levels of militant mass action, large-scale defiance of the law, and the forging of increasingly large class-wide ties of active solidarity between unionized and un-unionized, employed and unemployed, and the like. The mere presence of revolutionaries in a united front, however, doesn’t ensure that it wins. Sometimes a united front does succeed in winning a concrete demand, and this lays the groundwork for organizing to fight for more ambitious demands in the future. On the other hand, united fronts sometimes fail, due, for example, to missteps or betrayals by the more conservative, reformist elements in the coalition. When this happens, it is key that revolutionaries encourage the movement to see this betrayal as a learning experience that can teach more moderate activists to break from reformist organizations and move to adopt more radical positions. This, too, can lay the groundwork for building a stronger radical left that can win concrete demands in the future. There are enormous practical difficulties in applying this approach in any actual appropriate situation. Each such situation is different; each has, inevitably, unique factors. There is no substitute for the “knowledge, experience and…political flair” of which Lenin wrote, in solving complex political problems. The simple reiteration of the formulae will not suffice. But this much is clear: the united front is both the best way to actually win concrete demands and the only realistic strategy for making revolutionaries relevant in periods where revolution is not on the immediate agenda. This entry was posted in All Posts News Politics and-or Videos, History, Labor, Politics, Reform, Revolution, Socialism and tagged Broad Based Coalitions, Tyler James. Bookmark the permalink. My view differs from both comrades as follows. The failure of the current revolutionary left is not due to incorrect tactics and strategy in mass organizing — it is more caused by the refusal of the current organized revolutionary left to discard what I know as the curse of small circle mentality, or in other words the refusal to seriously struggle to build organizational unity amongst existing committed revolutionaries. This refusal leads to the impotence of small numbers of committed workers dispersed among many independent groups versus the potential of increased strength in a single organization. Dozens of small circles in reality add up to much less organizing energy than the sum their committed comrades actually offer if united organizationally. This to me appears presently to be the main problem facing the revolutionary left. Thanks, Cameron. I think this discussion needs to be had and all input is good to hear. Well, I’m glad I’ve read this article. I’m not entirely convinced by its theses, but at least now I know what the term “united front” means. I’ve wondered that for a while, and this article explains the term clearly. Tyler James, the author of the article, evidently favors the united front approach. I wouldn’t reject that approach completely, but personally I lean more toward what James calls the “ultra-left” approach, and I will try to say something about why. I’m not certain that my approach is better, but I can say a thing or two about it, anyway. The united front organizations have the appearance of being capable of accomplishing something. Ultra-leftists like myself do not. But perception is partly in the eye of the beholder. A united front organization is more likely to achieve some visible concrete demands, some concessions, such as temporary increases in wages or temporary increases in the availability of decent housing. Franklin Roosevelt’s New Deal was a set of concessions that saved capitalism; the New Deal has been gradually unraveling ever since. Holding onto the New Deal has been a never-ending struggle, like Sisyphus pushing his rock up the hill, because the New Deal never included the one most important radical change: a change in the power structure. Roosevelt left power in the hands of plutocracy. As I said, Roosevelt preserved capitalism. When people make “demands,” how often do they mention changing the basic power structure of our society? How often do they mention ending plutocracy? Indeed, the very use of the word “demands” implies a viewpoint of gradualism. You can try to gradually increase your wages. But you can’t gradually take power. Either the people have power, or they don’t. It’s like flipping a light switch. And understanding that is like flipping a light switch, too. Before the Civil War, some reformists argued for making slavery more tolerable. You know, pass laws to prohibit unwarranted beatings, and to require decent food and houing for the slaves. Those people didn’t get it. Either you’re a slave or you’re not. And today, people who demand higher wages but not power don’t get it either. I often hear compromisers telling me that you can’t educate the masses with theory — that they will only learn through struggle. But we are all in struggle every day, if only they would see it. Over half our taxes go to military imperialism, for instance. And global warming may soon kill us all, just to get a few dollars more in short-term profits for a few plutocrats. Trump is doing us the favor of making more obvious what has been going on all along. I’ll agree that you can’t educate the masses with theory that was written in 1940. I don’t know why so many leftists are frozen in time, spouting old rhetoric. James’s article, by the way, doesn’t have that fault. I appreciate hearing your viewpoint, Lefty. I like your new tactic of informing others about plutocracy and thanks for including your link to your piece. Lefty, you are very correct when you say we have to educate the masses from where they are, not where we are. Many groups have yet to understand this, and would rather demonstrate that they are the most revolutionary, the most radical. Perhaps they are, but that won’t impress someone who has begun a journey to understanding what’s really wrong but still clings to the illusions that the capitalist world bombards us with. Patient explanations and discussions, not breathing fire, is much the better route. Those who said to you that “you can’t educate the masses with theory — that they will only learn through struggle,” need some education in theory themselves. Theory and practice go together; practice without theory goes nowhere; theory without practice is nothing more than arm-chair philosophizing.